The Ottawa County Parks and Recreation Commission has managed invasive species for over ten years within its parks and open spaces. Initially, the primary target species was garlic mustard, but now our Stewardship Crew and volunteers work on a variety of species including herbaceous plants, vines, trees and shrubs. Volunteers and staff focus their efforts on areas that are high quality sites, such as Rosy Mound Natural Area, and on small new infestations that have the potential to grow larger, like Garlic mustard at Kirk Park. Because larger infestations take more time and money, we rarely work on big patches of invasives. However, we recognize that some of our properties are sources for continuous infestations, not only on our properties, but also on neighboring properties. Therefore, it has always been our intention to work at these sites once resources were available. Goats working together to eat autumn olive. Goats are a herd species. They work as a team to get food. Often one goat will hold a branch down while the other goats gather together to eat it. Begin managing large source populations of invasive species in non-sensitive areas without increasing our herbicide use or diverting resources from higher quality sites. Work with local partners (including those from the business and agricultural communities), volunteers, and staff to develop an innovative program that others could potentially use as a model. Develop a program that effectively manages woody invasives (including poison ivy) while ensuring the safety of the goats and the protection of the properties’ natural features. What do the goats eat? 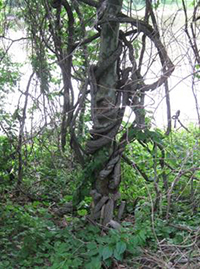 Oriental bittersweet is a destructive vine that makes the parks look like jungles and topples large trees. Pictured is Oriental bittersweet strangling an American sycamore at Eastmanville Bayou. Buckthorn is an ecological bully, pushing out native species. It degrades wetlands and other important wildlife habitat. Autumn olive quickly consumes openings and forest understories. Even if eradicated, an infested area is permanently affected by this invasive. Honeysuckle lures in birds for nesting and for eating its tasty-looking berries. Unfortunately, studies show nests in honeysuckle are less successful and the berries are far-less nutritious than the native plants they are outcompeting. Poison Ivy is an important native plant in healthy ecosystems. Wildlife, including deer and birds, eat poison ivy’s nutritious fruit and leaves. However, poison ivy is highly competitive and dominates in disturbed areas. When these areas are next to trails, Ottawa County Parks takes action to remove it. Goats have a very large liver. This is one reason why they can eat many foods that we would think are toxic. However, there are still foods that are toxic to them. The Grand Haven Area Community Foundation’s Youth Advisory Committee awarded Ottawa County Parks a grant funding an intern to care for the goats throughout the summer as well as collect scientific data. The project was also funded by the nonprofit group, Friends of Ottawa County Parks, who purchased additional fencing, giving the goats a larger area to work and requiring them to be moved less frequently. Ottawa County is one of the first park systems in the state, and the nation, to test this method of invasive species management. The scientific data collected by our summer intern will help create a model for the project as well as information to create a viable business model in the area.